In 1984, Bill Oddie and David Tomlinson wrote a book called The Big Bird Race, which told the story of a bird-watching competition held to raise funds for wildlife charities. 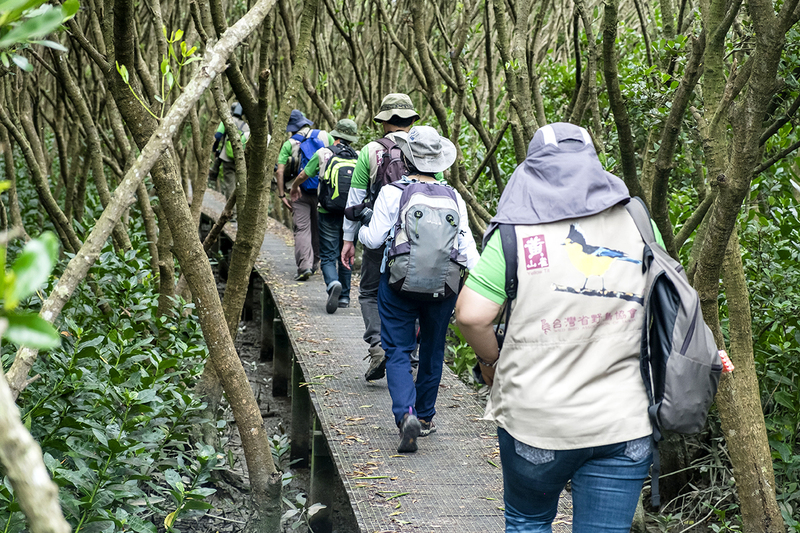 Inspired by the narrative, WWF-Hong Kong organised the city’s first Big Bird Race to raise money for the Mai Po Nature Reserve, inviting the Hong Kong Bird Watching Society to take part. Since then, the race has grown into a highly-anticipated gathering for bird lovers, both from Hong Kong and across Asia. 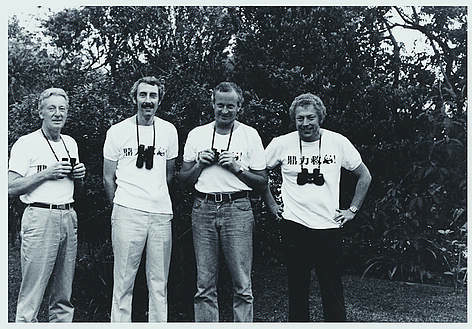 One of the participating teams at the first Big Bird Race, held in 1984. The Big Bird Race was a key event in the birth of Mai Po Nature Reserve, a Wetland of International Importance under the Ramsar Convention. In 1984, gei wai (shrimp ponds) in the Mai Po marshes were operated by government-licensed individuals. With conservation in mind, WWF began using funds raised from the Big Bird Race to buy one gei wai each year from existing operators, gradually taking over management of an increasingly growing portion of the wetlands. 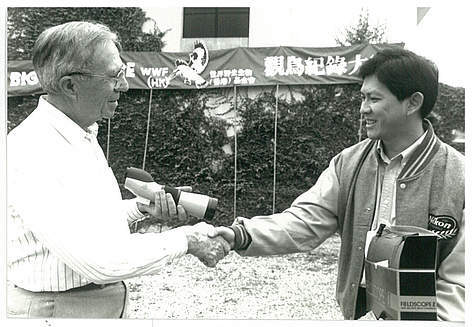 In the early 1990s, the government stepped in and bought out the remaining gei wai operators and turned them over under WWF management. In the 1980s, Hong Kong’s economy was booming and much of the countryside began to face pressure from development. Funds from the initial BBR races were used to purchase shrimp ponds in Mai Po to ensure precious bird habitats were preserved in the face of extensive development. The big question at Mai Po in the 1990s was “How can we allow the public to experience the reserve’s bounty without disturbing wildlife?” During these years, BBR funds were used to develop and improve visitor facilities inside the reserve, such as bird-watching hides and boardwalks and raise public awareness and educate people about the reserve. Thanks in part to these efforts, the reserve was granted Ramsar Site status in 1995 and was officially recognised as one of the world’s Wetlands of International Importance. 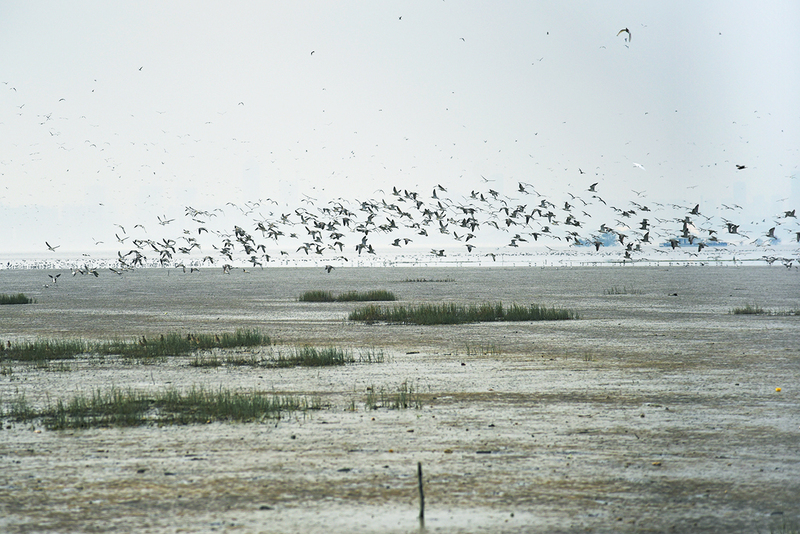 At the start of the millennium, most BBR funds were used to maintain the reserve as an internationally important wetland, while a portion of the funds was used to support the Asian Waterbird Conservation Fund. The fund promotes the conservation and protection of migratory waterbirds and their wetland habitats along the East Asian-Australasian Flyway; spanning a vast expanse from Australia and New Zealand in the south to Alaska and Russia’s Taimyr Peninsula in the north. In recent years, BBR funds were used for habitat restoration, specifically enhancing the roost extensions for waterbirds and other species. Thanks to these efforts, in the winter of 2011, the number of endangered black-faced spoonbills at Mai Po reached 332 – the highest known count in the reserve’s history. Funds from BBR 2012 were spent on the second phase of spoonbill habitat restoration works and the purchase of machinery to help enhance migratory bird roosts, improve the quality of freshwater ponds, and maintain the ecological integrity of the gei wai. Proceeds from BBR 2014 were used to enhance the landward end of gei wai #19. We separated the landward and seaward ends of that gei wai, and converted the landward end to freshwater habitats. Funds raised in BBR 2015 were used to rebuild the southern floating bird hide and purchase herbicide for controlling encroaching vegetation in the gei wai. Also, a new shelter was built to hold more shrimp harvesting tours in gei wai #19. All funds raised from BBR 2016 were used to de-silt reed beds in Mai Po’s gei wai #8b. The Mai Po reed bed is of regional importance as it supports more than 400 species of invertebrates and a vast number of bird species of global conservation concern, including the grasshopper warbler. BBR 2017 raised funds for restoring the habitat at gei wai #16/17, which is the most popular gei wai for both water birds and birdwatchers. The project included clearing vegetation to restore areas of open shallow water, repairing or rebuilding eroded islands for water birds to roost, and de-silting one side of the perimeter channels to improve the flow of water while preventing invasion of emergent vegetation from bund margins, particularly reeds. In 2018, we allocated funds raised to desilting gei wai #3/4 parameters to improve water flow and food providing capacity. It also supported the endangered great knot, which is under threat from various factors. For BBR 2019, we propose using funds raised to re-profile the pond floor and islands in gei wai #8. The work will include re-profiling the islands in 8a, which is a major hotspot for visitors located right in front of the tower hide, and changing part of the dry reed bed to a wet reed bed by lowering the pond floor to increase biodiversity (research shows that wet reed beds can support higher biodiversity than dry reed beds).